Editor’s Note: A previous version of this story incorrectly stated, due to an editor’s error, the date when the Arizona Independent Redistricting Commission began its work. That work began during the 2002 election cycle. The story below has been revised to reflect the correct information. Clients who used earlier versions of this story are asked to use the correction that can be found here. "The times, places and manner of holding elections for Senators and Representatives, shall be prescribed in each state by the legislature thereof; but the Congress may at any time by law make or alter such regulations, except as to the places of choosing Senators." 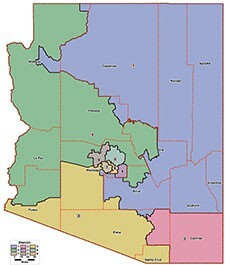 Click on the map for a fuller view of the final congressional district map drawn by the Arizona Independent Redistricting Commission after the 2010 Census. 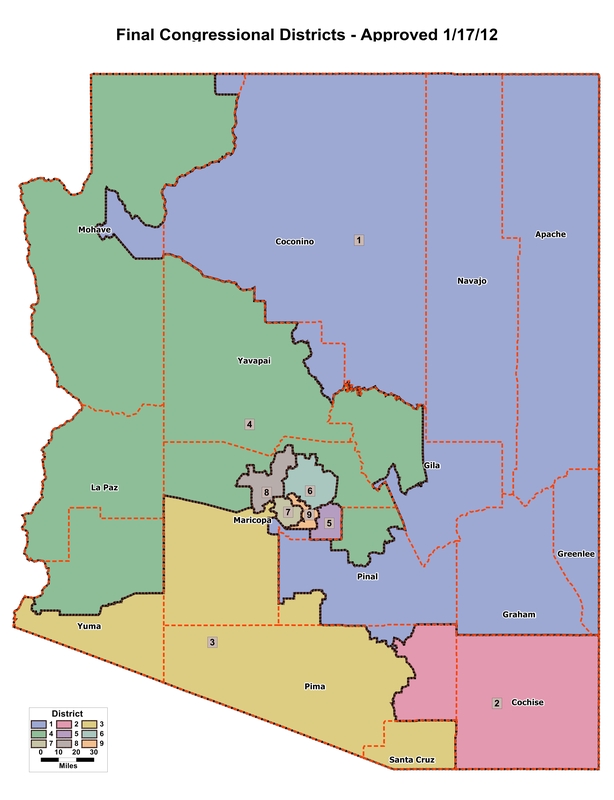 WASHINGTON – Supreme Court justices grilled both sides Monday as the Arizona Legislature argued that the voter-approved Arizona Independent Redistricting Commission unconstitutionally cut lawmakers out of the redistricting process. Liberal-leaning justices on the court questioned the Legislature’s argument that the power to set district boundaries was reserved for the elected body, with Justice Sonia Sotomayor noting that the commission was approved by voters. 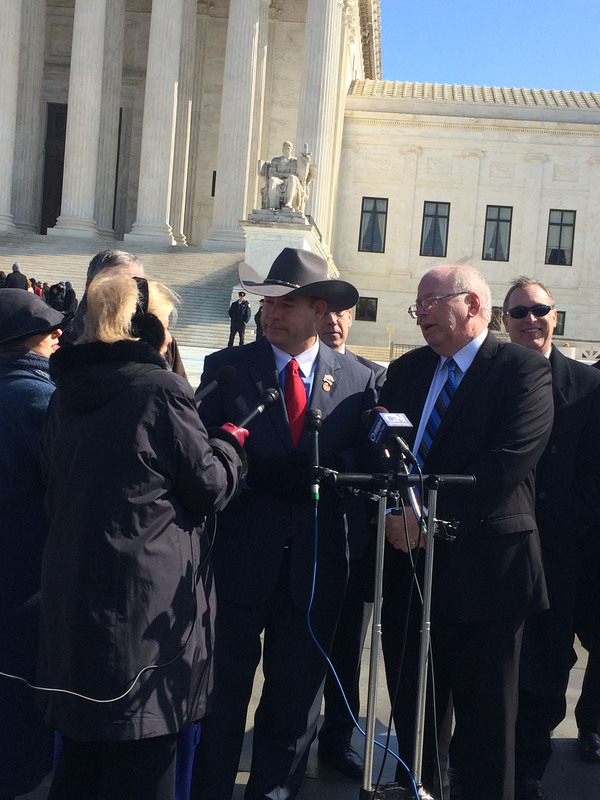 “What we have here is an unelected body of five people,” said Justice Antonin Scalia of the redistricting commission. Arizona voters created the Arizona Independent Redistricting Commission when they approved Proposition 106 in the 2000 elections, taking the power to draw congressional and legislative district boundaries out of the hands of the Legislature and turning it over to the commission. The commission is called on to redraw district boundaries in response to the decennial census. It was last called on after the 2010 Census, when Arizona gained a seat in the U.S. House as a result of population gains that boosted the state from eight representatives after 2000 to nine after 2010. The idea behind the commission was to take the process out of the hands of politicians and to hand it over to a commission that would be less likely to produce a partisan, gerrymandered map. But critics accused the commission of engaging in the same partisan gerrymandering that it was created to prevent against. Tobin said that outcry led to the lawsuit, which questions who holds the power to draw congressional districts. 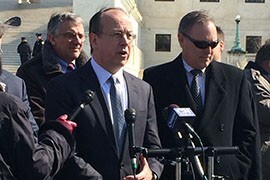 A divided federal district court panel in February 2014 sided with the redistricting commission, which led to the appeal to the Supreme Court. The attorney for the commission argued Monday that the “legislature,” as the Constitution defines it in this case, includes not only the representative state legislative body but also anyone who can make laws within a state. This includes the people themselves, he said, who can make law through ballot initiatives like the one that created the commission. That argument appeared to carry little weight with Scalia and Justice Samuel Alito, who pressed Waxman on his characterization of initiative-empowered voters as a legislative body, asking if there was anywhere else in the Constitution where the term “legislature” was meant to include the people by referendum. They asked if the people could declare war, for example. Waxman replied that he did not know. “The history is against you,” Justice Anthony Kennedy told Waxman, pointing out that although other states have similar redistricting commissions, Arizona’s is the first that cut the state legislature entirely out of the process. Paul Clement, arguing for the Legislature, agreed that the commission in Arizona completely cuts the Legislature out of the redistricting process. He disagreed with the idea that the power given in the Constitution was meant for anyone other than the representative legislature of a state. Kagan observed that if the commission and its redistricting maps were, as Clement asserts, “unconstitutional” due to their exclusion of the Legislature’s input, then voter ID laws and other ballot initiatives relating to elections that were made without the state Legislature would be considered the same. 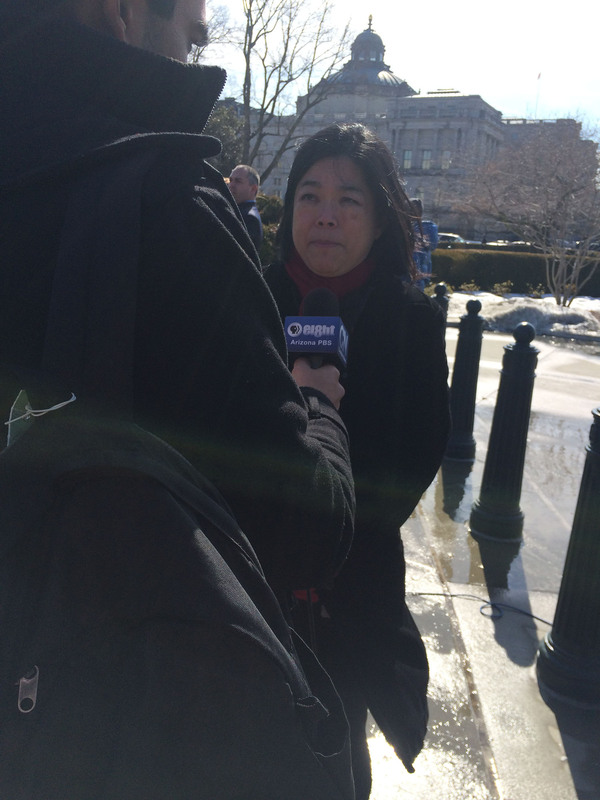 “Otherwise, the legislature could act on its own without any checks and balances, and that’s clearly not what our Constitution envisioned,” said Feng. The case is being closely watched, with 13 states and numerous advocacy groups filing briefs in support of the redistricting commission, while the National Conference of State Legislatures backed the Arizona Legislature’s position. 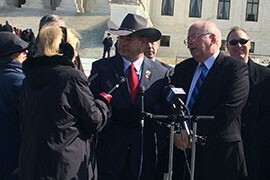 Arizona House Speaker David Gowan, in hat, and former Speaker Andy Tobin answer questions outside the Supreme Court, where lawmakers argued that hte state's redistricting commission is unconstitutional. 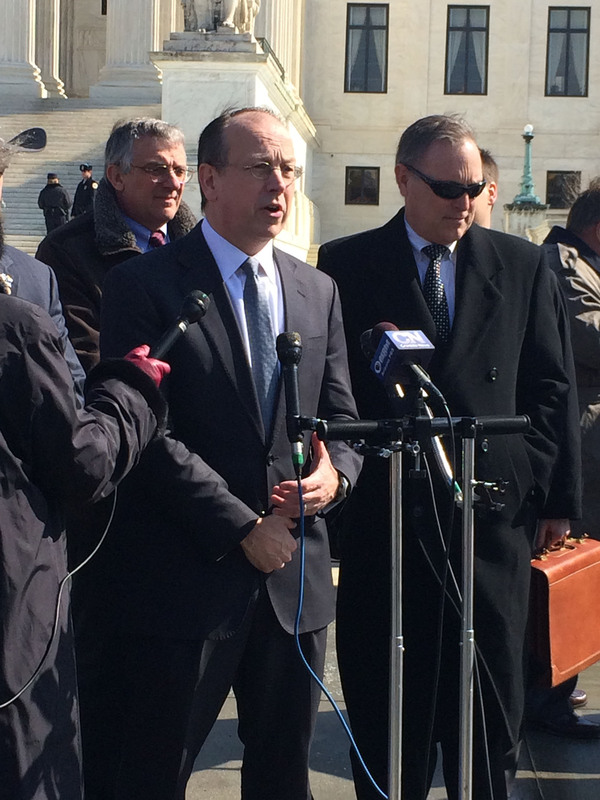 Paul Clement argued to the Supreme Court that the language of the Constitution is clear - only the legislature can set congressional district boundaries, not a commission mandated by voters. 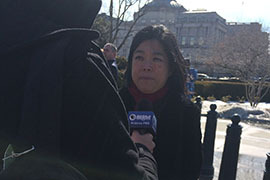 Kathay Feng, the natinoal redistricting director for Common Cause, said that the Constitution clearly did not envision giving lawmakers power without the checks and balances voters provide.